Goa Management Association, in association with Saldots Academy organised a one-day workshop on Customer Management: Creating Moments of Magic on 18 January 2018 at Hotel Grande Delmon in Panaji. Customer is always right; this is a very often quoted aphorism. Customer is the reason you are in the business. All customers are not the same and the same customer may have different needs. The same customer has different expectations at different times. An executive or manager responsible for managing customers, at any level of interaction, has the responsibility to recognise that a customer / customers have different personalities, expectations and needs. One must perceive, prepare and deliver the best experience, often called Customer Delight. It is necessary to prepared in advance with skills and tools to enable delightful customer service and create unforgettable experiences for customers. 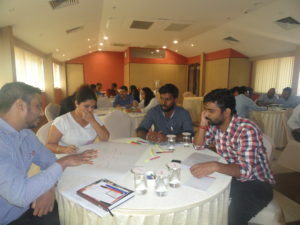 The workshop was aimed at equipping participants with tools to understand customers, improve relationships and create delightful interactions with customers, meant for entrepreneurs, HoDs, managers in customer care, customer service, sales, and all who deal with customers, internal and external. Structured into four modules, the workshop provided practical insights, involving real-life examples, cases and activities. The workshop was designed with a view to facilitate interaction, involving real life examples, cases and activities to gain practical insights into customer expectations, customer relationship management and customer service and to address needs of customers of every business organization. 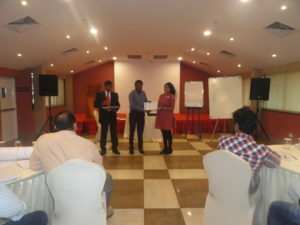 This workshop was facilitated by Dr. Pradeep B Salgaonkar, PhD (Customer Service). With over 25 years in industry and academics, and as consultant and corporate trainer, Dr. Salgaonkar has researched the service and retail industry and authored many cases and research papers. He is the author of the book, Marketing of Healthcare Services. He is a full-time trainer and facilitator in Customer Service, Retailing and Marketing & Sales. Attended by 22 participants from Deccan Fine Chemicals India Pvt Ltd, Finolex Cables Ltd, GKB Ophthalmics Ltd, Goldy Finepacks Pvt Ltd, Guala Closures, Magsons Supermarket, Borkars Developers Pvt Ltd, City Scape Developers, Fuel Point, Pentair Water India Pvt Ltd, Satori Care & Vaastu Estate Developers, the workshop was interactive. The workshop concluded with valedictory address by Mr. D Kumar Pillai, Immediate Past Chairman, GMA followed by presentation of certificates.